Nissan: new GT-R, Denki Cube and more | What Car? The revamped Murano range is also show, before going on sale towards the end of this year. Although it looks much like the previous car, the car has a new chassis, updated styling and an upgraded interior. Its 3.5-litre V6 petrol engine and continuously variable (CVT) automatic gearbox have been revised, too, and the suspension has been altered to improve ride and handling. Already on sale, the special-edition Note Acenta S is being heavily promoted at the show. Powered by a 102bhp 1.5-litre diesel engine, the car gets from 0-62mph in 11.1 seconds and on to a top speed of 112mph. It averages 55.4mpg and emits 136g/km of carbon dioxide. A particulate filter cuts out sooty emissions, too. Costing 400 more than the Acenta, extra features include climate control, automatic headlamps and wipers, and a six-CD player with MP3 connectivity. There's also an intelligent key system, which automatically locks the car as you leave it and unlocks it as you approach it. Nissan's GT-R supercar is here, too. It's been around so long now it hardly feels like a new car, although deliveries won't begin in the UK until March next year. More than 1000 have already been ordered, and you'll understand why after a quick peek at the performance figures. The car, which costs from 52,900, blasts from 0-62mph in 3.5 seconds and has a top speed of 195mph. 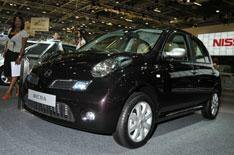 Nissan has launched a limited-edition Micra to celebrate the car's 25th anniversary in Europe. The engine line-up includes a choice of 1.2- and 1.4-litre petrols and a 1.5-litre diesel. A 1.6-litre petrol engine is available on the Micra C+C coupe-convertible. Audio controls on the steering wheel and iPod connectivity will be standard, as well as an engraved 4Gb iPod nano. The car is available in a new colour called Nightshade, which is a deep purple. It's the only Nissan that will be available in this colour. Other styling features include silver-effect door mirrors, handles and body mouldings, rear privacy glass and a choice of new wheel trims. A '25' logo is located on the rear door. Prices start at 9395 and rise to 16,600 for the 1.6-litre C+C with automatic transmission. You can see Nissan's electric Denki Cube Concept car at the show. Based on the current-generation Cube, which is sold in Japan, it highlights Nissan's latest electric motor drivetrain. Phew, with all that metal to show off, those folks at Nissan have been busy. Let's hope they remembered to bring the industrial-sized tub of car polish.